PORTLAND, Maine — The state with most black bears on the East Coast might change the way it manages its growing population of the animals, and hunters and environmentalists alike are keeping a watchful eye to see if there’s trouble brewing for bruins. Maine is home to more than 35,000 of the bears, up from just 23,000 less than 15 years ago, and the state wants to better manage that population growth to minimize the potential for conflicts between the bears and people. While bear populations are also growing in Vermont and New Hampshire, Maine’s has grown to be among the largest in the United States. Anecdotal evidence suggests the population appears to be growing the fastest in the southern and central parts of Maine, prompting wildlife managers to want better population estimates for different parts of the state, said Nathan Webb, a supervisor with the Maine Department of Inland Fisheries and Wildlife. The state has issued a request for proposals to develop a bear population model that would “inform the management of black bears” in the Pine Tree State, according to state documents. That could eventually result in tweaks to the state’s annual bear hunt, which has long been a source of conflict between animal lovers and hunters in Maine, in part because the state allows hunting with methods such as laying bait and chasing with hunting dogs. The possibility of tweaking the hunting rules has sounded alarms in the hunting and animal welfare communities. 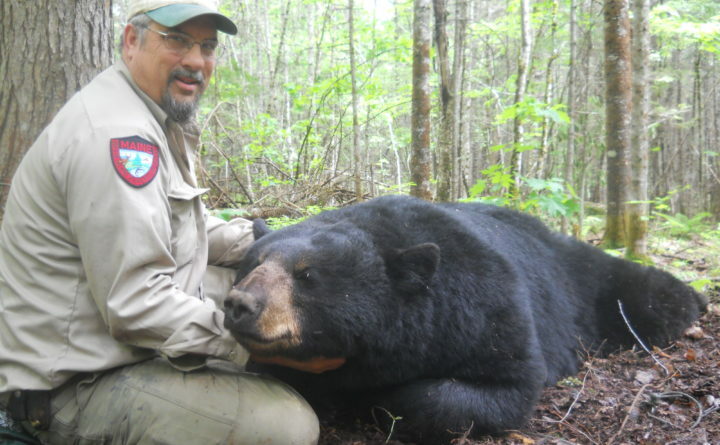 David Trahan, executive director of the influential Sportsman’s Alliance of Maine, said he fears the possibility of new hunting restrictions due to concern about bears in the densely populated southern part of the state. Meanwhile, Katie Hansberry, who directed an unsuccessful campaign to limit bear hunting methods in Maine in 2014, said the new population model should take into account the possibility that baiting bears actually grows their population by keeping them well fed. State wildlife biologists have disputed that notion. But there’s no question that hunters drop tons of human food in the woods during bear hunts, which are often unsuccessful, leaving bears who evade hunters with a free meal. “Hopefully, IFW hires someone who is well credentialed, and who will be informed by the best available science, including the well-studied phenomena that baiting black bears grows their population,” Hansberry said. Maine tracks the bear hunt and the number of complaints about nuisance bears in the state. The size of the bear kill has held steady at around 3,000 bears per year, while the number of complaints bounces between 400 and more than 1,000 annually. The state feels it might be able to better control the bear population by taking a more regional approach to management, Webb said. Currently, the state collects data on a statewide basis, while the size of the bear population and the animals’ chances of interacting with humans is very different in rural northern and western Maine than southern and coastal Maine, he said. Maine is collecting proposals about its request for a bear population model until Jan. 2. The winning bidder is expected to work with the state as a collaborator on the project. The state has not set a budget for the project, but potential costs will be taken into consideration, Webb said. Whether the effort pans out depends entirely on the quality of the new population model, said Daryl DeJoy, a critic of state wildlife policies who runs an animal welfare group called Wildlife Alliance of Maine. “I will be far more interested in who they choose and their methodology,” DeJoy said.